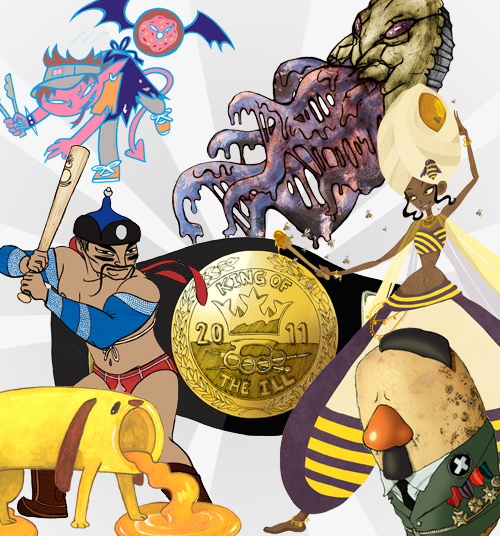 King of the ILL is a character design tournament in which tag teams designed by students from the Montserrat College of Art face each other in a juried competition. The 2011 edition, organised by Kelly Murphy and I, is judged by an all star jury of artists and designers, Ann Smith, Cutter Hutton, Paolo Rivera, Scott Campbell (“Scott C.”) and Willie Real. This entry was posted on Tuesday, November 22nd, 2011 and is filed under Character design, Illustration, Teaching. You can follow any responses to this entry through the RSS 2.0 feed. Responses are currently closed, but you can trackback from your own site.